Blowout Sale! 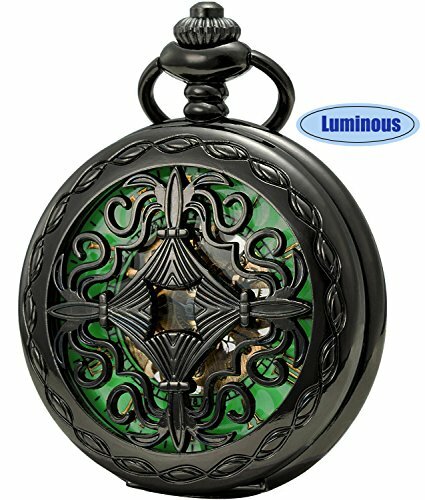 Save 62% on the SEWOR Vintage Skeleton Flower Mens Pocket Watch Luminous Case Mechanical Hand Wind (Skeleton Black) by SEWOR at Mas Fashion. MPN: C202. Hurry! Limited time offer. Offer valid only while supplies last. SEWOR 17 Jewel Mechanical Hand-wind Movement. Unique Skeleton Classical Dial with Roman Numerals. Smoonth Back Case Allow Engraving. For safety.The Front Face is made of Acrylic instead of Glass.Color:Bronze. Comes with a high quality 7mm width Cowboy Chain,Chain Length:365mm. case diameter:47mm. Nice addition to a formal or casual dressing or colleting. 100% Brand New with excellent workmanship, Precise golden mechanical movement. Twisting the top button on the spin by clockwise about 15-20 arounds, Tightening a walk for 24 hours, Please wind up the watch before every usage and keep away from magnet to avoid making it stop working. PERFECT CHOICE - Come in with Good Quality Brand SEWOR Leather Gift Box. Perfect gift for your love and family and yourself. Best Valentine day Gift, Superb Christmas Gift, Birthday Gift, Wedding Gift etc. For the working environment which is not allowed to wear wrist watch, like chef or nurse. If you have any questions about this product by SEWOR, contact us by completing and submitting the form below. If you are looking for a specif part number, please include it with your message.